More than 1,000 firefighters are battling a forest fire in Portugal that has claimed the lives at least 64 people and injured more than 130 since Saturday. Many of the victims died after becoming trapped in cars as they tried to flee. Planes have been used to drop water over the Pedrógão Grande region. Civil protection officials have said they expect the blaze to be under control soon, but warn that soaring temperatures are hampering efforts. The week's highest temperatures in the area are expected to reach around 38C (100F) and, together with windy conditions, could reignite fires already quelled. Despite 70% of the fire now under control, officials said what remained was a source "of great concern". One of the victims has been identified as a 40-year-old firefighter who died in hospital. Many died inside their cars as they tried to escape or were a short distance from them when they became trapped. The government has declared a state of emergency in the forested region around Pedrógão Grande, north-east of the capital, Lisbon. Civil protection commander Elisio Oliveira said there was great concern for the fires still burning. He described the operation as "complex" and said many residents were being forced to evacuate. The blaze continues to rage on several fronts. One volunteer rescuer quoted by Reuters news agency said teams were not optimistic about bringing the blaze fully under control anytime soon. "Low humidity, windy conditions and high temperatures will easily re-ignite the fire, and it will spread very fast," he said. When asked about the plan for Tuesday, he added: "It all depends on the weather." Police believe the fires were started by lightning on Saturday during an intense heatwave and rainless thunderstorms. Why are Portugal's wildfires so deadly? Wildfires are an annual menace in Portugal. More broke out there between 1993 and 2013 than in Spain, France, Italy or Greece, the European Environment Agency reported last year, despite the country's relatively small geographical size. Given that, was this year's tragedy preventable? Could Portugal have done anything more to save lives and minimise the damage? Read more: Just what makes Portugal such a tinderbox? One of the worst-hit areas was around the village of Nodeirinho. Thirty bodies were found inside cars and another 17 next to vehicles on the N-236 road. Portuguese media have dubbed the N-236 the "road of death". 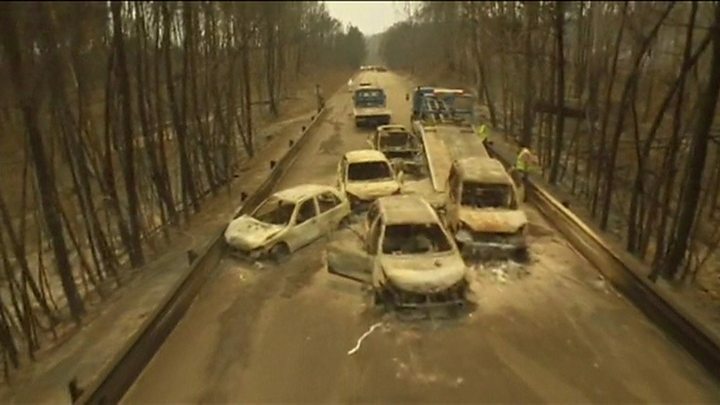 A few miles north, 11 people died in the village of Pobrais, many as they tried to escape the flames. A survivor spoke of the roads being blocked and of no-one coming to their aid. Betty Jesus, a 50-year-old Venezuelan who has lived in the area for decades, said: "I have witnessed a lot of fires, but never like this. The way it spread, the speed." Virgilio Godinho, who lives in the village of Figueiro, said the fire quickly overwhelmed the community. 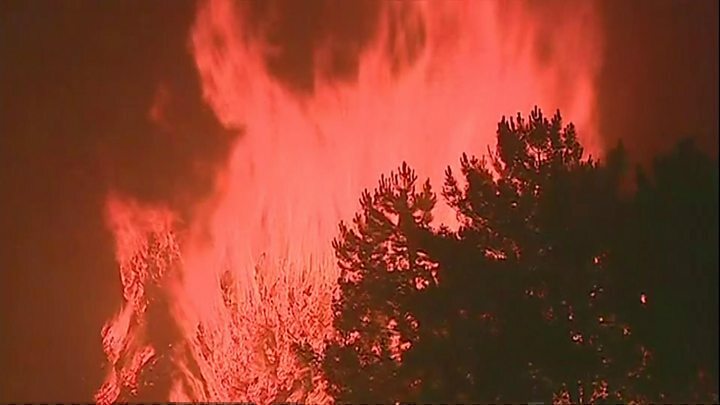 "The fire didn't spread by the ground, it spread through the air at the height of the trees. In five minutes all were on fire in an area of around 10km," he said. Portugal is observing three days of mourning for the victims.